POWEROLL rollers are manufactured by Power Precision & Fabrication Ltd (established 1966) and since the first one rolled off the factory floor in 1997 have continuously developed to become the finest and most versatile self-propelled grass rollers on the market. A range of 7 new machines with rolling widths from 2 to 6 feet (61cm-183cm) are available with 3 and 4 feet wide machines being the most widely used. 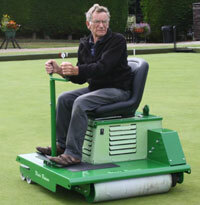 Poweroll rollers are used on playing surfaces for all standards of sport, from the smallest village club to international standards, at various locations around the world, on every continent. 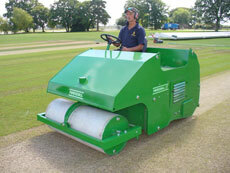 POWEROLL cricket pitch rollers have been designed to provide the professional groundsman with a comfortable, user-friendly, purposeful and versatile machine; simply ‘The right tool for the job.’ These machines also offer flexibility with regard to their weight. The options available for each model enable the groundsman to select the most suitable machine for his requirements, and of course available budget. Speaking of budgets, if you’re a poorly funded club based in the UK, and that’s about 90% of you, have you considered looking into the possibility of grant money to assist your new roller or greens iron purchase? Phone us and we may be able to point you in the right direction. As our company name suggests, since incorporation in 1966, the company’s history traditionally lies with machining and steel fabrication services. Machined metal components and metal structures are manufactured for clients to their own requirements and specifications and used for many different industrial applications around the world. This work continues to this day, and we are always pleased to look at new projects from new sources. Maybe even manufacture that obsolete component to keep your old roller working! Take a look through our website and if we can be of any more assistance, phone us during UK office hours or return the email enquiry form. Our manufacturing facility is located in the beautiful and historic Tamar Valley in East Cornwall. If your club need a new roller and a trip to Cornwall appeals, you may like to visit our factory and see for yourself, where and how Poweroll rollers are built. Please call first to arrange an appointment.